Australian design brand Page Thirty Three has released a range of homeware, including objects that owners are encouraged to "complete" themselves. 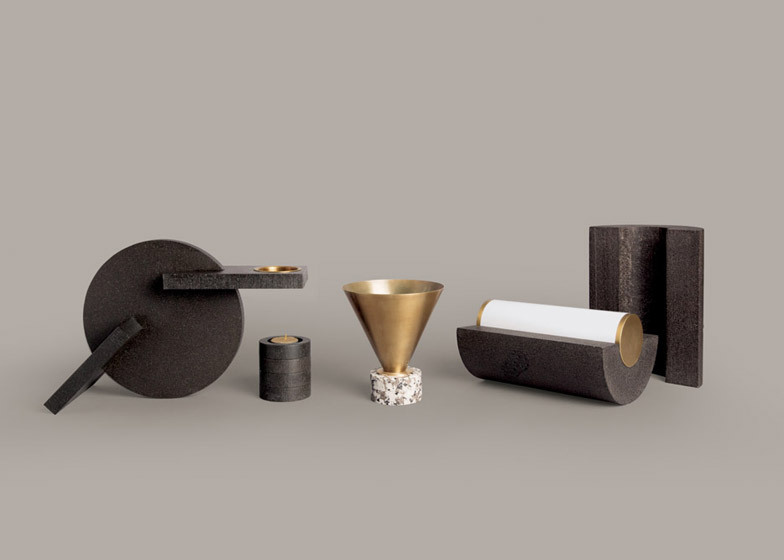 Everyday items are transformed into what the brand calls "modern-day monoliths" in the Tactile Equations range of products, which combines stone sourced from Page Thirty Three's home country with brass elements. The five-piece line comprises a table, an oil burner, an incense burner, a lamp and a candle holder, each of which warrants a degree of owner participation to either complete or rearrange the item. "Page Thirty Three's objects are playful, they encourage a tactile response, or aesthetic equation to master in order to finish the piece," the brand said. "This personalisation enhances the emotional connection between user and object." The collection's Stratosphere lamp is made from hand-polished Australian Bluestone with machined brass ends. A cylindrical bulb is encased in the outer layers of stone, which splits into halves that can be rearranged to adjust light levels. The lamp can be stood on its end and also laid horizontally. Bluestone is also used in the Superstructure oil burner, which includes a brass dish held in a platform attached to a flat circle of stone. An incense burner features a spun-brass cone that rests in a granite base. Powder-coated steel candle holders interlock with each other, with the option to be used individually or joined together to create a cluster. The collection's largest piece is the Zig Zag table, composed of an electroplated brass base with blackened pine inserts and described by Page Thirty Three as "angular but not angry". Functioning as a puzzle, the table requires the pine pieces to be added in order to create a flat useable surface. "Just as ancient cultures realised the importance of enhancing the human and earth bond, Tactile Equations seeks to bring this to our modern world," the brand said. Page Thirty Three was founded in 2010 by Ryan Hanrahan and Bianca Riggio, and designs artwork and homeware including furniture, lighting and accessories, with all pieces designed and made in Australia. Other emerging Australian designers include Glen Baghurst, who launched his first collection of furniture and products at the 2015 Stockholm Furniture Fair.